The is a family 70 genera and 2000 species of flowering herbs, shrubs and small trees. The family is distributed worldwide, although most of the species are in the Northern hemisphere. Many of those in the Southern hemisphere are in South Africa. The family Lobeliaceae is generally included in the Campanulaceae. Many species have a milky, non-toxic sap which contains latex and discourages insect predation. Leaves are generally simple and alternate. The Campanulaceae use inulin as a storage polysaccharide, rather than starch, a unifying characteristic of the Order Asterales. The bisexual flowers have an inferior ovary and generally have 5-fold symmetry, but sometimes 3-10 fold. Petals may be fused and are and are red, blue or purple and occasionally yellow. The five stamens may be fused into a cylinder around the central style and mature before the style. The developing style pushes the shed pollen out of the way before it unfolds and becomes active, reducing the chance of self-pollination. Fruits are capsules or berries. from the Hawaiian islands, is the only truly succulent genus in the Campanulaceae. Brighamia is probably monotypic for Brighamia insignis, although 4 species and some variants have been described. The milky sap is typical of Campanulaceae. 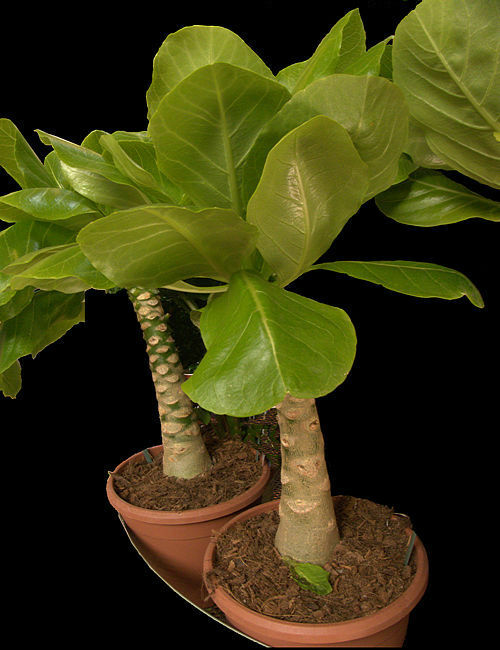 Brighamia insignis has thickened succulent stems bearing rosettes of large, thin oval leaves. The grey bark is patterned with leaf scars. The inflorescence is a cluster of white bells. The natural hawk moth pollinator has become extinct so reproduction of the remaining plants on sea cliffs is almost impossible, except that it is reportedly being managed by human intervention. As the plants usually die after flowering, natural survival of the species outside botanic gardens is problematic. Although these succulent plants are occasionally seen for sale, they are reportedly difficult and the fleshy stems susceptible to rot if over-watered.